Product #1863 | SKU MBAG80PN | 0.0 (no ratings yet) Thanks for your rating! 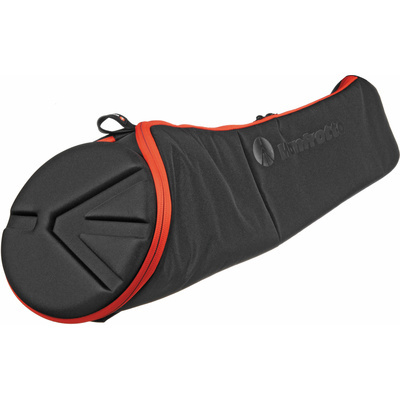 The Manfrotto MBAG80PN Padded Tripod Bag is a padded ballistic nylon bag designed to carry Manfrotto tripod with a head up to 80 cm long. Thermoform padding holds the tripod in place and protects it, especially the head, during transport. It also serves a double purpose by protecting the tripod's hard edges when it is carried. The zipper extends down the length of the bag, but also fully opens the top end of the bag. The end opening allows for faster "quiver" style extraction and insertion of the tripod. The inner pocket holds accessories (such as video head pan bars). The bag is tapered to follow the shape of the tripod and head. Compatible with Manfrotto tripod with head up to 79 cm long.